Having problems with a noisy central heating pump? In our 5-minute guide, we’ll cover all the possibilities. Whether your pump is banging, ticking or humming, this guide will help to diagnose and fix the problem, as soon as possible. If you’d prefer a boiler engineer to fix the problem, you can get in touch here. Rather get a new boiler fitted and have repairs covered on a warranty of up to 10-years? We recommend BOXT. They have backing from Bosch, so fit boilers at competitive prices. You can get boiler quotes on screen in less than 90 seconds using their clickable online form. And, if your fault isn’t covered here, skip over to our boiler problems guide. Let’s start with the #1 most common reason that contributes to having a noisy central heating pump; air locks. Air can get into the system, and when it does, it needs to be bled. It can cause noisy boilers, radiators, heating pipes, and of course, knocking and banging pumps. 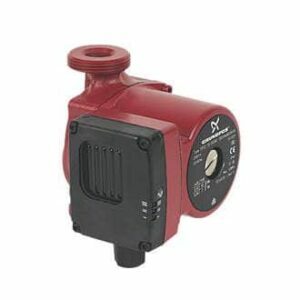 Modern pumps such as Grundfos, will have a bleed screw. Carefully open the screw until you hear a hissing noise. Leave the screw in this position until the hissing stops. You’ll notice a slight dribble of water at this point. This indicates that the pump has been completely bled of air. Now you’ve bled the air from the pump, check the pump has been installed correctly (this isn’t as uncommon as you might think). If the pump isn’t installed correctly, even after bleeding, it will continue to get airlocked. You’ll have a noisy heating pump again, within a matter of days. Also, an incorrectly installed pump will cause excess wear on the shaft’s bearing. This will lead to a whining noise coming from the heating pump. The pump should be horizontal, and the bleed screw at the side. And if it’s not, you’ll need to adjust it so that it is. The bleed screw shouldn’t be at the top. Even the a few degrees off horizontal could affect the pumps ability to circulate water (causing a boiler lockout) and cause it to prematurely wear out. If you’re getting a humming noise, or lots of vibrations from the pump, internal components are seized (most likely, the pump’s shaft). The energy that usually turns the pump’s shaft has to go somewhere, and it converts to the noise you’re hearing. A slight tap on the side of the pump should free internal parts. But, you’ll want to take it apart and clean it out. Also, inspect the bearing on the shaft. If the shaft hasn’t been sitting horizontally, the bearing will have worn out, and it will seize again. Dirt is also a big issue when it comes to internal seizures (see #4). If your central heating pump is noisy, there’s a good chance it’s blocked full of dirt. This is particularly the case if you don’t have a boiler filter fitted, or it’s been incorrectly fitted on the wrong side (yes, this actually happens). The pump needs to be taken apart, cleaned and inspected for wear. Fit a boiler filter to catch debris in the heating system, so it doesn’t get blocked again. Old pumps will typically be more noisy than newer ones. They are less energy efficient and the energy efficiency loss, is usually converted to an annoying humming noise. High-quality pumps will have flow settings (usually 3). And, most properties don’t need the pump to be on the highest flow setting. Locate the flow setting switch. If it’s on the highest setting, turn it down one. Check your radiators and towel rails are still getting up to temperature. If they are, this setting is fine. The reduced flow rate won’t just reduce the noise of your central heating pump, but will also reduce your electricity consumption, and prolong the life of your pump. Having issues with a noisy central heating pump, and can’t fix them? Speak to a repair engineer here. 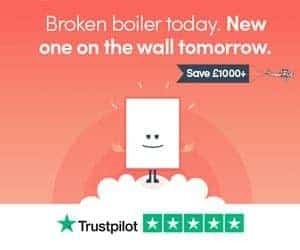 Prefer a competitive price on a new boiler with a long warranty? Get your quote within 90 seconds using this form. And, we’ve created an article on other heating pump problems here, if your fault isn’t listed above. Or, if you have any questions about your noisy pump that are not covered above, leave a comment below.